PROJECT MOONBASE - This is a proof of concept video I wrote & directed for a potential sci-fi comedy series set in the near future. SYNOPSIS: In the year 2043 the astronauts of Moonbase Genesis are replaced by a cast of reality TV rejects to create a show like “Big Brother” in space. Unfortunately, a freak accident blows the moon out of earth’s orbit and into deep space and an uproarious sci-fi odyssey. Humanity’s least deserving ambassadors will meet alien cultures, tackle reality TV tropes and contend with zero gravity toilets. A follow up feature documentary to The Bindlestiffs (see below) from 2008 This short teaser is a short film all it's own. THE BINDLETIFFS - documents a year in the travails and triumphs of The Bindlestiff Family Cirkus. SYNOPSIS: Sixteen years ago, Stephanie Monseu and Keith Nelson created the Bindlestiff Family Cirkus, one of the last true touring vaudeville shows in America. Their shows combine traditional circus high wire aerialists, clowns, and juggling with sideshow denizens like swords swallowers, fire-eaters, and burlesque dancers. With these basic ingredients, The Bindlestiffs cook up an alchemical brew that promises to enthrall audiences. But their showbiz dream does not come easy. It takes hard work, dedication, time and more than just standard juggling. The company is precariously balanced and fighting off bankruptcy. Without a patron of any sort, and a national economy in tatters, Stephanie and Keith must find the will to make it happen. The show must go on. The path they find, and the heart and strength it takes to get there, involves gunning a motorcycle across a wire twenty-feet in the air, cracking whips, eating fire, and their clown Kinko’s audacious real-life bid for the presidency of the USA. 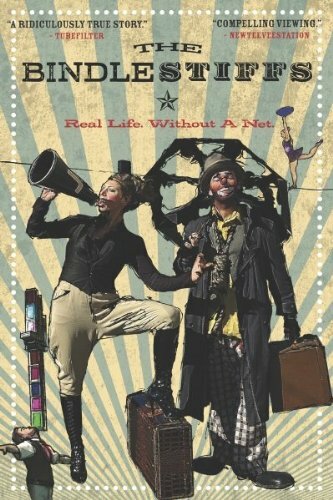 Prepare yourselves for a rare peek behind the curtain into the lives of true modern circus vagabonds as they live their lives, and run their business without a net.